Do you like to read books? I read at night. I try not to read in the shop because it looks bad to the customer. Recently I've been waking at stupid o'clock 3am but been happy to read until it starts to get light outside. Currently I'm savouring Toni Morrison's 'Beloved'. It's a rich read but an anxious one. On any page something horrifying may be described and I'm a bit of a wimp. I can't read about the Holocaust or ghost stories or gory crime thrillers. I like something literary - ideally it's won a prize - then it already has other peoples' seal of approval. When I find an author I like I read everything written by them. As a child I read what was on the bookshelf. An absolute red letter day was when Mr Loom arrived on business from England and he always brought me a wonderful childrens' book. Swallows and Amazons, Alice in Wonderland, What Katy Did, The World of Christopher Robin, Fairy Tales from Hans Christian Anderson all were handed to me from his suitcase and all are still with me on the shelves of my bookcase now. One of my favourite things is the pack of gold glitter alphabet stickers by Meri Meri above. How did Father Christmas know they are exactly what I wanted? And the pretty jotter notebook from friend Sue will have pride of place on my desk in HH. Perfect presents. I wonder if there is a website called that? What a fun job it would be to find perfect presents for everyone all the year round... Oh yes, that is what Handmade Happiness aims to do...! I am thinking about fun workshops or making sessions in Handmade Happiness during the rest of the winter months. It would mean a different furniture layout so there was always a table free for people to sit round. I would like Pam Dew (patchwork, applique, sewing) to lead a few workshops as she did, so successfully last year. I wonder what other craft skills would be popular? Well what weather! This Christmas will surely be remembered as the wettest Christmas. On Monday it took my younger daughter five and a half hours to do a half hour journey by train from Guildford. When the train did finally get moving it struck a tree on the track and was too badly damaged to continue. On the drive to see my mother yesterday in East Grinstead we saw several cars abandoned in deep water on the road. Luckily my son-in-law is a good driver and steered us safely through flood water. He has an extra person to protect now. On Christmas Eve he and my lovely girl Amy announced that they're expecting a baby! Visitors to Handmade Happiness will know this already! I haven't been able to keep quiet about it. A first grandchild on the way is a BIG DEAL! But now the three month scan has taken place I am officially allowed to announce it online. Ta da! My daughter wants me to knit a 'whole wardrobe' of clothes.They must be ultra soft but able to go through the wool cycle on her washing machine...all suggestions welcome. Did you have a nice Christmas? I sincerely hope that you are having a wonderful time. I hope you, dear reader, have the best Christmas ever. Good company, a relaxed atmosphere, happy memories and tasty food. That is what I wish for you. Thank you for bearing with me through the ups and downs of the past year and a special thank you and a kiss to everyone who left a comment! Handmade Happiness is open today til 4.00pm. Enjoy your Christmas! My grandfather loved crystallised fruit. Seeing it reminds me of Christmas. My brother must have got a cap gun because I remember my Dad using it. At that time he was getting pesky phone calls from a man who just said,'I weel keel you.' Driven to exasperation by the frequency of these calls one Christmas Day Dad grabbed my brother's toy gun and shot off several caps directly into the mouthpiece. That might have stung a bit... Anyway there were no more calls. Crystallised fruit, reels of caps for toy guns I'm not sure you can get those things any more. Children today seem to want money or an i-Pad or clothes. It's magic to watch their faces as they look through Frank Higgins' handmade kaleidoscopes in Handmade Happiness. Or to see the little ones reaching towards Sue Inglis' hand-knitted cats, mice and bunnies. A good compensation for the dark afternoons is to light candles and see their cosy glow. And at night I love to watch the Christmas tree lights flash providing the only light for a while. In truth I have a very small Christmas tree this year. I wanted a real one, with roots, to plant in the garden afterwards. In recent years I've endured a white fake tree but yearned for the real thing. Then last year I heard people talk about paying £80 for the real thing and that put me off even looking. I found my small but beautifully formed tree outside Waitrose. I've tried photographing it but it looks pathetic. Next year, when it's grown a bit I'll show you a photograph! Handmade Happiness is buzzing. A good place to find unique-to-the-shop presents. And at prices to please all pockets - there are lots of things at £3, loads to choose from at £5 and at the other end of the scale you may if you want to spend £150 or £200 on that very special present for someone you love. Now I want to make some felt for flower brooches before work. Yesterday I painted Christmas puddings for earrings - they're in the shop now and if I can just make a couple of sheets of colourful felt I'll be well on the way to some brooches which are another well-priced present for Christmas. Just a reminder - Handmade Happiness is open every day now until Christmas. 10-5 daily except Sunday when opening hours will be 9.30 til 3.30 and Tuesday (Christmas Eve) when I plan to close a little earlier at 4pm. 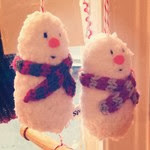 If like me, you don't like the gift tags in the shops or the ones you like are too expensive, why not make your own? Start by covering an A4 sheet of white thin card with torn pictures from magazines, old Christmas stamps, bits of gift wrap etc. I've then highlighted bits with a gold pen but this is optional. Get a luggage label and measure it. Using ruler and pencil mark out the back of your collage with rectangles the same size as your luggage label. Cut out your labels, from the back ignoring the front. Puting your luggage label over each piece cut the corners and mark on the back a dot for the position of the hole. Using a hole punch add a hole to each piece. Tie a scrap of collected old ribbon in each new gift tag. Easy eh? If you wanted to you could add a bit of glitter, as I have before cutting up the A4 collage. You could also sew on a button, glue on sequins, use your own painted paper. Have fun and play! My marathon starts today. Handmade Happiness is open every day now til Christmas. Today I'm only open from 10-12.30 but that's flexible - if people want to come in I'll stay to the end of the day. Do you feel there's still so much to do before the big day? Lists, lists and more lists. That's my way of feeling in control. Somehow if it's on a list it's nearly done! This week there are a few 'handmade' programmes on the telly to relax with in the evening. Last night and repeated on Tuesday BBC2 7pm the Great British Sewing Bee showed us some sewn decorations and gifts. I liked Stuart's man bag and worthy winner Ann's impressive teddy bear which reminded me of Steiff bears. Tonight it's Kirsty Allsopp's turn (8pm C4)- the review I read mentioned tie dye underwear (interesting) and mincemeat flavour popcorn (err not interesting!). And this Saturday sees the final of Strictly Come Dancing. After weeks of intensive excercise the female celebs can now be thrown about as if they were as light as a feather. Which they probably are by now. Appearing on Strictly must surely be the most fun diet in the world! Open today (Saturday) as usual. Closed tomorrow Sunday 15th. Open just from 10 til 12.30 on Monday 16th then open as usual until marathon week when I'll be open 9.30 to 3.30 on Sunday 22nd; 10-5 on Monday 23rd and on Christmas Eve (Tuesday) I'll be open from 9.30am until 4pm. After Christmas I'll take a two week break, just opening the shop during that time on Saturdays - December 28th and January 4th. I had to photograph this tiny puppy. A-dor-able! There are all kinds of visitor at Handmade Happiness right now. I recognise some of them as regular customers - people who recognise the quality of well-made, handmade in the UK presents. I love it when people really look. They spend time examining the virtues of each thing, moving slowly round the shop. They are often creative people who either make things themselves or who collect what others have made, hoping that one day they will have the time to create something beautiful themselves. Or they tell me they haven't a creative bone in their body but they appreciate what others are capable of doing. I never believe this claim by the way. I think everyone is creative but some have unfortunately been put off by a thoughtless comment from a parent or teacher which has dashed their confidence. Some people say they are unable to draw. I feel like replying, 'When did you last try?' Because every talent needs time spent developing it. There was an interesting item on the radio today about research into how successful artists spend their days. Not sitting about waiting for the muse to descend apparently but in a work routine using their skills whether the muse chooses to visit or not! Similar scrap packs by Penny Baker are available in Handmade Happiness now. I had a lovely day off yesterday in Chichester where as well as doing some Christmas shopping I met an old friend for a coffee in M&S and had lunch with another friend who lives in the town. I appreciate what Chichester has to offer far more now I don't actually live there! There is such a variety of shops, I seem to find new ones every time I visit. I heard on the grape vine that tkmax may be moving into what used to be the Sadlers Walk shopping arcade on East Street. All we need now is for an Ikea to set up shop on the outskirts of Chichester and every shopping need will be catered for! If you like the Christmas window at HH and you live in the area please vote for it in the Petersfield Post window competition running next week and the week after. I've no expectation of winning. I'd like to see Tara Interiors win as her window is spectacular! And I'll be voting for that one! However hopefully Handmade Happiness gets better year on year and this is its third Christmas. Onwards and upwards! Bee Mellor's work is in Handmade Happiness! Long before I moved to Petersfield I used to come over from Chichester to visit my friend Bee Mellor. Bee is a special artist and I've always admired her work. Bee and her husband moved to Australia to be with their daughter (and now grandchildren) but we've always kept in touch via email and since I opened Handmade Happiness I've always wanted the marvellous things Bee makes in the shop. Yesterday a parcel arrived in the post from Australia with these beautifully made 'pockets' inside. Specs or phones or sunspecs fit them, there is a silk lining and a velcro tab to keep them safe. Which colour would you choose? In the dark evening Ali Cooper's pretty tea light holder shines out. Ali Cooper works with porcelain making beautiful objects that I am proud to sell in Handmade Happiness. This year she won a free stand at the Country Living fair after a magazine competition. The shop has a lot more examples of her work. Come in and see! I am enjoying having a day out between writing posts on this blog. Christmas is surely the most busy time of year for all of us - especially if we know we're having relatives to stay over the Christmas holiday. To stay healthy and positive we must try not to get too stressed with the pressures that Christmas brings. Which is easier said than done. Have a Chillaxing Christmas if you can. Sheila Barrow's embroidered paintings in white painted frames. Vicki Hunt's wonderfully depicted birds - painted then outlined in stitch. I am proud to display three artist's original paintings in Handmade Happiness. Excuse me ladies. I am not deaf. But I am 100% certain that this painting is not available online! Do you like the new gallery idea at Handmade Happiness? It's only now that I have enough paintings to fill a wall like this. Which is your favourite? I too love Sandra Izard's brilliant work but it is out of my league price wise. I must admit I will feel a pang when Sheila Barrow's long embroidery of the Downs sells.